From an inspection – not my house! I had to laugh when I started looking into this as a subject to write about. The recommendation is to wash your house at least once every 2 years. Hmm… So that might explain the lovely green hue covering one whole side of my house! I have NEVER power washed my house and have owned it for over 20 years! Obviously, it’s time! It’s not just a good idea for curb appeal, but also as a great prep for painting, even if you only have the trim around the windows and doors. If you are in the same situation as I am, here are the basics compiled from several articles I found when googling DIY house washing. Before starting, research any special instructions for the type of siding that you have. 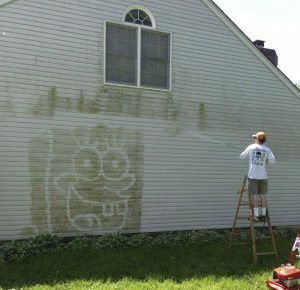 Start by preparing your house and the area around it. Choose a clear day and don’t wash in direct sunlight. You don’t want the sun to dry the cleaning solution before you have time to rinse it off. Do only one side of the house at a time. Again, you don’t want the cleaning solution to dry before you have time to rinse it off. Apply the cleaning solution from the bottom of the house to the top, holding the applicator at least a foot away from the siding. This will prevent dirty streaks from forming on the dry siding. Important If your house is more than 1 level you will need an extension pole for the pressure washer. You want the pressure wand to be sprayed as perpendicular as possible. 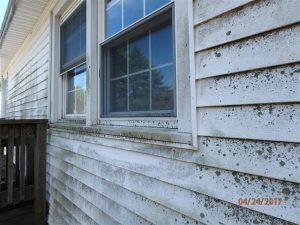 You don’t want to spray up underneath horizontal siding and you should NEVER pressure wash on a ladder! Pressure and water could easily cause you to fall. Let cleaning solution sit for 5-10 minutes to help loosen the dirt and mildew. Rinse from the top down – again, holding the sprayer at least a foot away from the siding. Sounds like in an afternoon I could pretty easily transform my house back to the completely yellow color I bought so long ago! Another adventure to undertake that doesn’t sound particularly overwhelming. Now to just find the time!